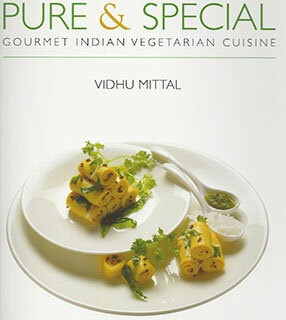 Nearly two years ago, we reviewed Vidhu Mittal’s true-to-its-name “Pure & Simple.” Now the Bangalore-based author has a new cookbook, “Pure & Special” filled with easy-to-follow recipes, step-by-step colorful photos and handy tips. Mittal begins by delving into spices, herbs and vegetables, fruits, nuts and lentils. The chapters are divided into drinks, soups and salads; snacks and appetizers; main courses; rice and breads; accompaniments; and desserts. Here are two of the 110 recipes reproduced from the book with permission from the publisher. This delicately spiced kebab has an unusual golden-green color that adds a visually pleasing dimension to this delicious hors d’oeuvre. Boil 3¾ cups water, add the broccoli florets, and cook for 2 minutes. Drain in a colander, cool, grate, and set aside. Mix the grated broccoli and paneer with squeezed bread slices, celery and parsley pastes, freshly ground black pepper, and salt to taste. Divide this mixture into 10–12 equal portions; shape into round, flat patties and set aside. Pour oil to the depth of ¼” in a shallow pan and heat until hot. Add 3–4 patties and at intervals, using a slotted spoon, drizzle hot oil from the pan on top of the patties until the sides being to turn light golden brown. Flip and fry until evenly brown on the other side. Remove and drain on a paper towel. Serve hot, accompanied with Date Yogurt Dip. Repeat the process to shallow-fry the remaining patties and serve as above. This dish is known as the queen of dals and is usually served on special occasions. In a pressure cooker, combine the soaked black gram with the spice mix ingredients and 5 cups / 1 l water. Pressure cook the lentils to one whistle on moderate heat; simmer for 30 minutes and turn off the heat. Once the pressure drops, open the lid. (Alternately, use 6 cups / 1½ l water and cook in a soup pot until tender.) Cool the lentils and pick out and discard the bay leaves, cinnamon stick, and cardamom pods. Lightly mash the lentils with a potato masher or the underside of a ladle. Turn on the heat, bring the mashed lentils to a boil, and cook on moderate heat for 10 minutes. Add the cream and whisked yogurt and simmer for 30 minutes. In a separate pan, heat 1 tbsp clarified butter for 30 seconds; add the cumin seeds, red chili powder, and the puréed tomatoes. Cook on high heat for 2 minutes and add to the simmering lentil mixture. Bring the mixture to a boil on moderate heat and continue to simmer for 30 minutes. Add salt to taste, sugar, and garam masala powder. Continue to simmer for 10 more minutes and transfer to a serving dish. For the tempering, heat 1 tbsp butter in a tempering ladle for 30 seconds, add the ginger juliennes, and cook for 30 seconds. Now add the slit green chilies, chopped cilantro leaves, and red chili powder; immediately pour over the hot lentils and top with 1 tsp butter; serve hot.